1. Fill a large pot with lightly salted water and bring to a rolling boil over high heat. Once the water is boiling, stir in the macaroni, and return to a boil. 2. Cook the pasta uncovered, stirring occasionally, until the pasta has cooked through, but is still firm to the bite, about 8 minutes. 3. Reserve about 2 cups of the hot pasta water, then drain the pasta in a colander set in the sink, and rinse with cold water to cool. Set aside. 4. 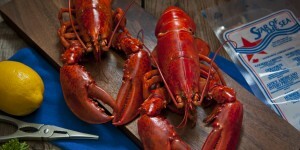 Return the pasta water to the large pot, and place the lobster halves in the pot, cut-side up. 5. Return the water to a boil, then reduce heat to medium-low, cover, and steam the lobster just until the meat firms and turns opaque, about 3 minutes. 6. 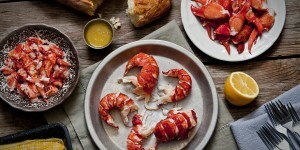 Remove the lobster and allow to cool for a few minutes, then remove the meat and cut into bite sized pieces. Reserve the shells. 7. Melt 2 tablespoons of butter in a saucepan over medium heat. 8. Stir in the onion and cook until the onion has softened and turned translucent, about 5 minutes; scrape the onions into a small bowl and set aside. 9. 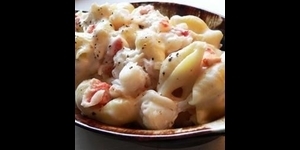 Place the reserved lobster shells, garlic, shallots, peppercorns, and milk into the saucepan. Bring to a gentle simmer over medium heat, and cook for 20 minutes. 10. Preheat oven to 350 degrees F (175 degrees C). 11. Melt 5 tablespoons of butter in a saucepan over medium-low heat. 12. Whisk in the flour, and stir until the mixture becomes paste-like and light golden brown, about 10 minutes. 13.Strain the milk through a mesh sieve. 14. Gradually whisk the milk into the flour mixture, and bring to a simmer over medium heat. 15. Cook and stir until the mixture is thick and smooth, 10 to 15 minutes. 15. Stir the Gruyere, Cheddar, and Romano cheeses into the thickened milk mixture until melted and smooth. 16. 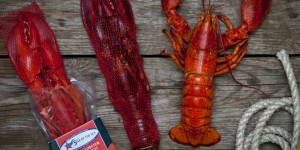 Season to taste with salt and pepper, then stir in the reserved lobster, onions, and macaroni. 17. Pour the macaroni into a 4 quart casserole and smooth the top. Sprinkle evenly with the panko crumbs. 18. Bake in the preheated oven until the sauce is bubbly, and the top is golden brown, 8 to 12 minutes.